I'm embarking on a project which will keep me on my toes...errr...challenged each week. A project that I hope will help keep the creative juices flowing and help me learn more about photography. Many calls it project 52 or focus 52, it's taking one photo each week for the entire year. For me it's not as daunting as a p365...I know I set 2011 as my year to do more, but hey I have to be realistic here. A p365 fails short on the Attainable criteria for a smArt project (as far as I'm concerned though). 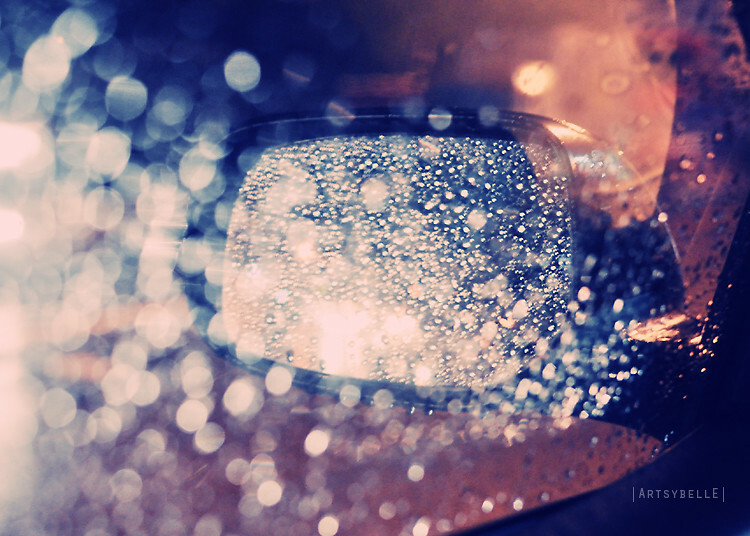 So to kick off this project here's one that I took through a car window. This photo pretty much summarizes what my week had been...driving in the rain. Don't worry, I was not driving when I took this shot . It had been raining since the first of January. Rain only stopped for a few hours (probably to take a break and catch it's breath); then, it would rain again from day to night. Rainy days had never been my favorite...bad memories, but not just that...I was afraid to grab my camera and took any shots during a rainy day because I always had in mind that it would be dreary, forlorn, and sad. Last night I set my mind to take a look at rain differently. Boy, I was glad I did and I was so surprised at the amazing bokehs and streaks of lights from raindrops and passing cars' headlights. I was having fun and was on a roll, I won't look at a rainy day the same way again. Lesson here, if I just redirect my mind or change my perspective on something, there sure will be a treasure waiting to be discovered.